Captain White has been a firefighter for over 12 years, 11 of those have been with Fairview. He describes the multi-faceted benefits gleaned through this type of training, “Anytime you can handle the ladder truck, it is beneficial. It helps build muscle memory for the time when you need it in real life. It gives you the opportunity to make mistakes in the training ground, not on a fire ground.” He said it was a good opportunity to reiterate the importance of the basics with recently hired Firefighter Feig and make sure that everything was familiar to him. 2016 Pierce 105’ ladder truck with 500 gallons and a 2000 gpm pump. This truck is stationed at Fire Station One on the west side of Fairview to serve the commercial district. Firefighter Feig has been a volunteer firefighter for three years. He was hired by Fairview FR four months ago; this is his first paid firefighter position. Feig said he chose to be a firefighter because, “My grandfather was a firefighter and I enjoy helping people in my community.” Regarding the value of this training, he said, “This training gives me the opportunity to follow steps on how things should be done. I can step back before I do something and look at the bigger picture. I can do all of this in a safe environment without anyone’s property being in danger.” Working well with a team, paying attention to instructions and following directions from the officers were also added advantages. During this training, White, Smotherman and Feig participated on two live fire scenarios. Their first assignment was fire attack and their second assignment was ventilation. The scenarios were based on a hotel/motel fire. This scenario required firefighters to think about life safety concerns of a large occupancy building as well as associated hazards. Firefighters maneuvered hose lines in close quarters, set up ladders for secondary escape routes, communicated with on scene units and manipulated a ventilation prop. During ventilation training, they brought a second ladder up to the roof in order to distribute their weight on the roof. Cutting ventilation allows heat, gas and smoke out of the building to create better visibility for firefighters inside the building.
. Captain White and Firefighter Feig cutting a ventilation hole on the roof during a fire scenario. This assignment is always coordinated with the other interior fire crews. 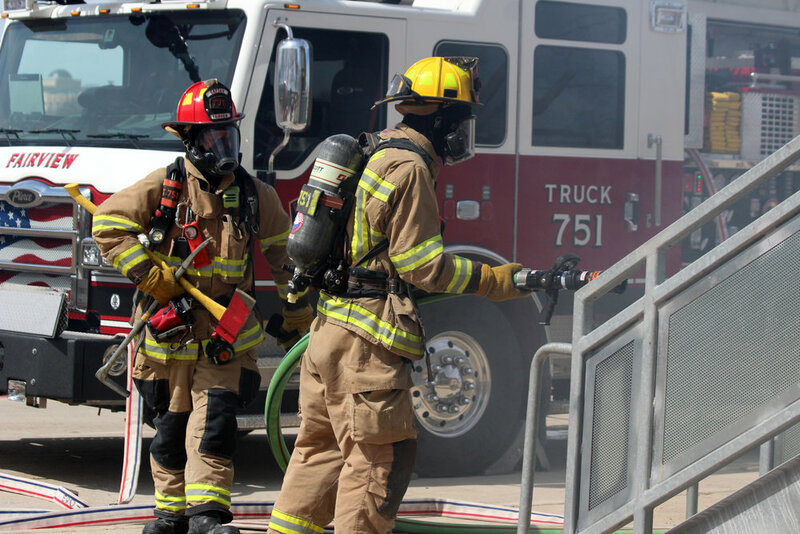 Chief Bell said that they are required by the Texas Commission of Fire Protection to have 20 hours of training a year. He added, “We must show every year that this has happened. We far exceed this requirement and are typically around 10 – 20 hours a month.” An additional training motivator is the ISO (Insurance Services Office) rating. Fairview FR is currently at a rating of two on a scale of 1 – 10, one being the highest. In addition to live fire training, Fairview FR undergoes hazardous material training, EMS training, extraction training, forcible entry training and others. This training was paid for by the Collin County Excellence Fund. All agencies within Collin County are eligible to use this facility for training. This particular training was sponsored by Allen FD. Chief Bell explained that sometimes Fairview FR trains independently and sometimes they partner with other agencies. (From left) Step-up driver Austin Smotherman, Firefighter David Feig and Captain Nathan White. These three are assigned to Station One on A-shift.